The final draining, forming and modeling of semi-hard cheeses is carried out in the press. GEA has developed a complete closed press-housing that allows the precise control of pressure, temperature and humidity for each individual cheese. We manufacture pneumatic control Paneer Cutting Press to cut the paneer blocks into approprite sizes.The machine is provided with electrical panel with automatic times. Can tipping Bar is used at milk reception dock to support can while emptying it in Milk weighing system. 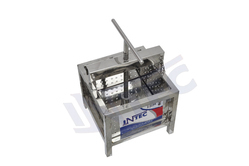 We Supply pneumatic control paneer cutting press to cut the paneer blocks into appropriate sizes. Cheese press is used for compressing the fresh curd in order to remove excess of extra whey, since spoilage of the cheese is hastened by retention of too much water in the finished cheese.